The long-awaited new manual on this critical topic includes over 25 years of rules, changes, lessons learned and solutions developed by renowned experts on this critical topic. Based on the 2002 Reform Rule, the Manual focuses on collecting and explaining existing policy and decisions. See the full description, table of contents, introduction, and author bios here https://www.awma.org/nsrmanual . Normally within two business days after your purchase, you will receive an email with the encrypted (5.5MB) document attached, and instructions and password for registering your device. Adobe Reader or Acrobat is required on your machine, along with installing the FileOpen plug-in. After installing FileOpen, opening the document with the password will automatically register that device. 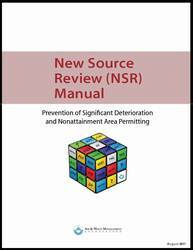 We also want to make sure you receive important updates on the NSR Manual, so please log in to the website before ordering . If you are not an A&WMA member and do not already have a user account, you should create an account before ordering. Please be sure to state your affiliation. This purchase provides use and download on one device. If you wish to purchase for more than a single-device subscription or are with the US Government, please click the NSR Manual category on the left for other options.